The Tata Safari is one tough SUV that is still going strong even after so many years of being launched. The latest version, called the Safari Storme is even more bigger and powerful than the previous variants and is even used by the Indian Army. 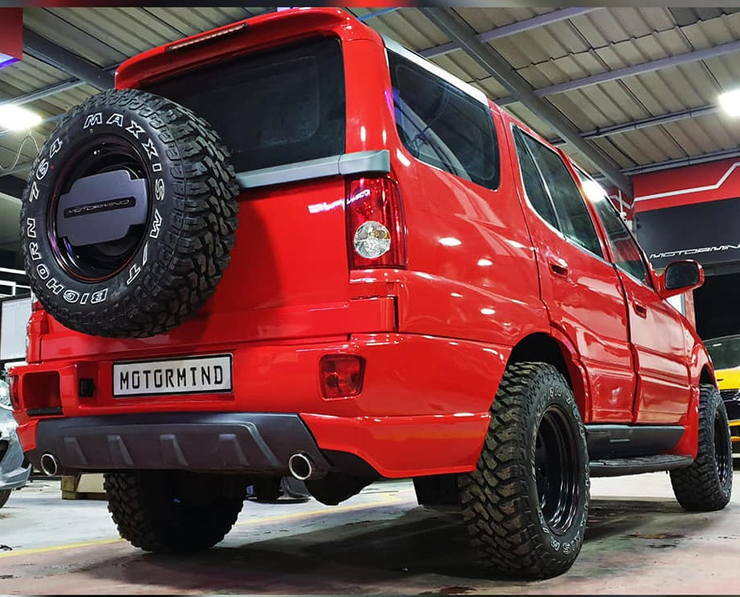 Now Motormind Automotive, which is a leading auto customization shop of the country, has created a custom kit for the Safari that looks radical. They have been known to make some of the best mod designs including low-rider Chevrolet Cruze among others. Take a look at the Safari below before we get onto further details. The Safari here has been given a butch treatment mixed with lowered stance that looks pretty cool. The Tata Safari is one big SUV and still dwarfs many other SUVs in the market even after being a very old product. Also, the Safari featured here is the older model and the the latest Storme model. Coming to the changes made on the car, the first thing to catch attention is the shiny bright red paint job that shouts for attention. The front of the car is lowered thanks to a custom bumper which has a slightly ground hugging stance. The bumper houses the airdam and gets dark grey garnishing around it. The headlamps have been given a smoky effect which makes them look good. LED DRLs have also been fitted on the front bumper in order to make the car match shoulders with the newer generation models. The bonnet gets a blacked out sheet which contrasts well with the overall red paint scheme. The roof also houses several reflector lights and all these touches come together to give the SUV a unique look. The sides are largely the same save for blacked out side steps and the body panel above it. A black band of wrap is also visible at the rear shoulder line added for aesthetic purposes. The rear matches the front in terms of looks. The tail lights and the bumper have been kept the same but a blacked out rear diffuser looks pretty good and makes the rear feel sporty at the same time. It diffuser is also fitted with twin exhaust pipes and they further up the visual appeal. Another highlight of this Safari are the big butch wheels, which are off road spec units. They are fitted onto blacked out rims and give the car a definitive personality. 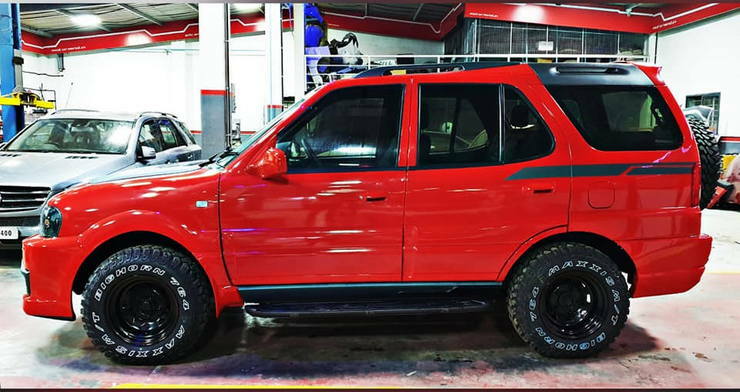 A SUV has a lot of its visual appeal depending on the tires and this mod job has taken care of that pretty well. 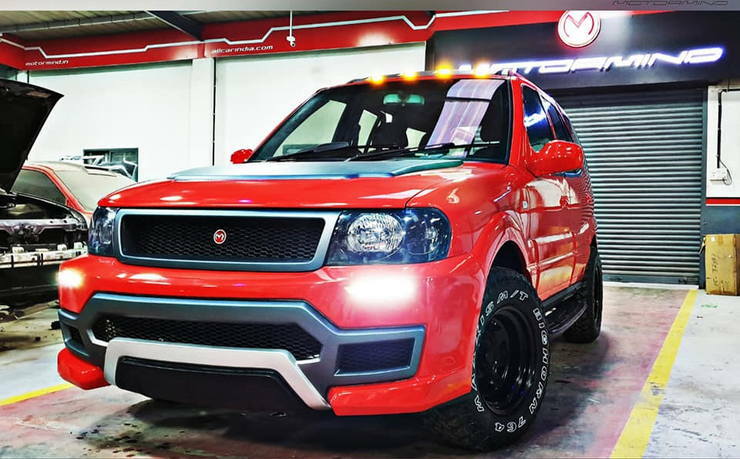 While the shiny red paint job may not suit everyone’s taste, there is no doubt that the body kit adds a lot of visual drama to the Safari.